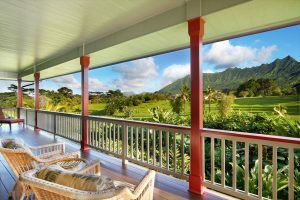 NEW LISTING: Quality, location and a true Hawaiiana feel with unbelievable mountain views. 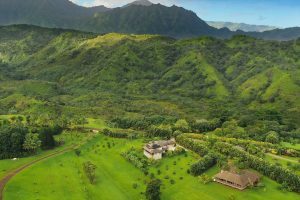 If Kauai is your place to be then do not miss this jewel. Built 2007, two story 3BD/3.5 BA with master on the first floor. Designed for comfortable and elegant living indoors and out. Guest bedrooms upstairs, each an en-suite with their own private lanai. Quiet cul-de-sac location in Namahana Farms, Kilauea, HI. Bountiful fruit trees, raised garden area for planting edibles, and lush floral gardens all to enjoy. Attention to detail is evident in every room. Well maintained, feels like new. Energy efficient with solar and propane appliances. Built-in outdoor grill and fire pit with backdrop views of the Kauai North Shore mountain ranges. 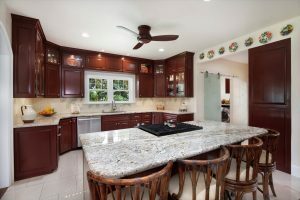 Over-sized two car garage with numerous built-in storage cabinets, work area and more. Just beautifully done. 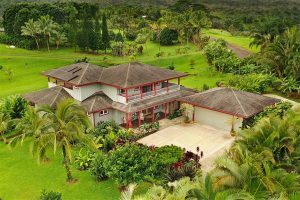 This entry was posted in Kauai Real Estate on January 30, 2019 by Hawaii Property.